St Cuthbert’s Way is a 62 mile (100km) cross-border route linking the places of interest in the life of 7th century St Cuthbert. The route was opened in 1966 and is rich in history. You walk through attractive and varied countryside between the Scottish Borders town of Melrose and the Holy Island of Lindisfarne which is connected to the mainland by a causeway. The highlights include a high-level crossing of the Cheviot Hills, Eildon Hills and the Northumberland Fell Sandstone Moors. 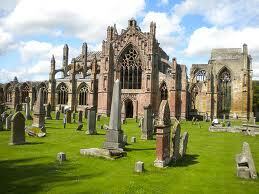 Along the way there are abbeys, churches, castles and prehistoric remains to view as you go. There are plaques at the start and finish of the walk - at the Melrose Tourist Information Centre opposite the Abbey, and at Holy Island Post Office. Each night on the trail you stay in a different location in selected accommodation, with breakfast provided. Your luggage is collected daily and moved to your next accommodation. You can start your St. Cuthbert's Way self-guided holiday on any date of your choice between April and October. Generally a moderate route though some strenuous walking is encountered when crossing the hilly sections. The terrain varies from footpaths, farmland, country lanes and rolling moorland. The route is waymarked throughout with the St Cuthbert’s Cross Symbol and is generally easy to follow with the aid of a map and guidebook. Evening meals, packed lunches, drinks and snacks, travel insurance, travel to Melrose and from Holy Island, souvenirs, laundry services, etc. Accommodation is provided in carefully selected walker friendly B&Bs, Guest Houses, small Hotels and Inns. All rooms are ensuite or have private facilities. St Cuthbert’s Way is a 62 mile (100km) cross-border route linking the places of interest in the life of 7th century St Cuthbert. The route was opened in 1966 and is rich in history. You walk through attractive and varied countryside between the Scottish Borders town of Melrose and the Holy Island of Lindisfarne which is connected to the mainland by a causeway. The following is intended to provide further information about the route. Please note that all distances and heights in this document are approximate and along with all the other information are provided as an aid to describe the route. Melrose (height above sea level 85m) to Harestanes (60m). St. Cuthbert's Way starts at the gates of the magnificent ruin of 12th century Melrose Abbey in the Borders town of Melrose. From Melrose, a steep climb takes you over the saddle (310m) between the Eildon Hills. There are wonderful views in every direction. The route descends to the village of Bowden and leads you through farmland and woodland to Newtown St Boswells. A short walk along the banks of the River Tweed takes you into St. Boswells (90m). You continue along the banks of the River Tweed for a short distance then walk across farmland to follow Dere Street, you will be following in the footsteps of the Romans who built the original road, now a tree lined grassy track across the undulating landscape to Harestanes Countryside Visitor Centre. Overnight accommodation is at Jedburgh, which is 4km/2.5 miles off route, you can either walk there or transport between the route and Jedburgh will be provided. Harestanes (60m) to Kirk Yetholm (100m). You re-join the route at Harestanes and pass Monteviot House then cross the River Teviot. After a short walk along the river you follow paths across farmland and open moor to the village of Cessford and the ruins of Cessford Castle, once the stronghold of the Kers, notorious Border Reivers. The route now follows country lanes through the village of Morebattle (95m). St. Cuthbert’s Way now takes a route over the hills to Kirk Yetholm; this is regarded as the hardest section of the walk. You follow paths as you climb Grubbit Law and cross Wideopen Hill (368M), the highest point on St. Cuthbert’s Way, then Crookedshaws Hill before descending to Kirk Yetholm. Kirk Yetholm is the northern most point on the Pennine Way and you may meet walkers finishing or are about to start the 268 mile route across the rugged backbone of England. Kirk Yetholm (100m) to Wooler (50m). The route leaves Kirk Yetholm along a short section of the Pennine Way. You climb and cross the hills (340m) to Hethpool (120m), passing one of many hillforts along St. Cuthbert’s Way and crossing the border from Scotland into England. At the border you will cross into Northumberland National Park, one of Britain’s best kept secrets. Then it’s on through woodland and a good track along the Cheviot foothills. The route rises to 340 metres and you cross the hills to the small market town of Wooler, where you will find shops, cafes and pubs. Wooler (50m) to Fenwick (40m). Between Wooler to Fenwick the terrain is easier as St Cuthbert’s Way crosses rolling hills. You leave Wooler and follow paths over Weetwood Moor (150m), quiet lanes then lead to Horton. Paths and tracks lead across farmland to woodland owned and managed by the National Trust. Here you will find St. Cuthbert’s Cave, a sandstone cave where monks took St. Cuthbert’s body in 875AD as they fled from repeated Viking raids on Lindisfarne. After a short uphill walk you get your first view of Holy Island and Lindisfarne Castle. The route leads you into woodland and onto the village of Fenwick. There is a scattering of nearby accommodation. Fenwick (40m) to Holy Island (15m). From Fenwick it is a few miles across farmland to the Causeway, which can be crossed at low tide to Holy Island. Plan your day so you arrive to walk over to the island when the tide is out and it is safe to cross. Having reached the Causeway you can either cross via the Causeway Road or follow the posts of the historic Pilgrims Path across the sands. Once on the island it is a short walk to the village and the end of St. Cuthbert’s Way. Here you can see the ruins of the Priory and view Lindisfarne Castle. The nearest train station to Melrose is at Berwick-upon-Tweed, onward bus services operate to Melrose. Approximate train journey times from Edinburgh to Berwick-upon-Tweed 40 minutes. Approximate train journey times from Newcastle to Berwick-upon-Tweed 45 minutes. Approximate train journey times from Berwick-upon-Tweed to Edinburgh 40 minutes. Approximate train journey times from Berwick-upon-Tweed to Newcastle 45 minutes. The bus stop in Melrose is a short walk from your accommodation. 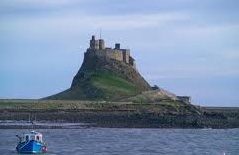 Bus services operate from Beal, Holy Island Rd End which is 5 miles from Holy Island. A limited minibus service operates from Holy Island to Beal. Alternative transport is by local taxi service. Trains - see above for travel from Edinburgh to Melrose. Approximate journey times 2.5 hours. Trains - see above for travel from Holy Island to Edinburgh. Approximate journey times 1.5 hours. Trains - see above for travel from Newcastle to Melrose. Trains - see above for travel from Holy Island to Newcastle. Dean & Corinna, A quick email to say thanks for planning/booking accommodation and luggage transfers for our recent St Cuthbert's Walk. Apart from an hour or two rain as we crossed over the border - the weather was remarkably kind to us (Sep 18th - 22nd) and we enjoyed an excellent walk with excellent accommodation throughout. Feedback on luggage transfers: never saw or heard them, it just worked = perfect...I should say all cooked breakfasts were great. Hello Dean, We were delighted with our walk and all the arrangements through NWW. Everything went smoothly re luggage transfers and the accommodation was mostly excellent. We would definitely recommend NWW and hopefully book another walk with you. Hello Dean and Corinna, We are back home now after walking St. Cuthbert's Way Fabulous trip with excellent walking. Thank you again for arranging the lodging and luggage transfers. It all worked out beautifully. We walked segments of the West Highland Way and The Great Glen Way and are considering doing the 2 combined, in the future. We will certainly contact Northwestwalks when we make our plans. Again, thanks for all that you did. Hi Dean, Just to let you know that we had a very successful walk on the St Cuthbert's path last week, and even the weather was kind to us. All of the arrangements worked well and we were most satisfied. The accommodation en route was very good and the hosts were most welcoming. Hello Dean and Corinna, Although we never got to meet you, I wanted to let you know how wonderful our walking holiday in the Borders area was. Although we had some wet weather the first couple days, it was beautiful for the most part. Every place of lodging was wonderful and different from the next. The walks were the right amount of challenge for a couple of women in our 50's. And the map you sent was a great help. We also made good use of Ron Shaw's "St. Cuthbert's Way" official guide, which gave us needed details for a portion of the way, so you may want to recommend that book to your customers. I think this was one of the best vacations of my entire life, and I wanted you to know how well it went for us. Thanks again! Dear Dean and Corinna, I thought that you would welcome some feedback on self-guided St Cuthberts Way…Firstly everything went according to plan, the accommodation was good, carrylite delivered our bags on time every day, the walk is very well way-marked and the map and guidebook were very helpful. 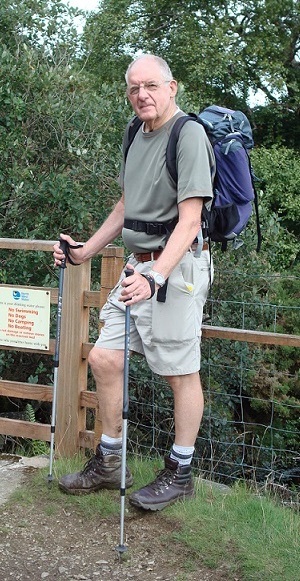 The route in general is very well-maintained and presents a delightful variety of landscapes and terrain to walk through…..
Hello NWW, Just wanted to say how much Linda and I enjoyed St. Cuthbert’s Way earlier this month. The weather was fantastic the whole time and the accommodation was superb, it has to be the best yet. We will definitely be booking for next year but can’t decide which walk to do yet!! Many thanks again for your attention it has been excellent. Many thanks for a well organised trip. Our 4th with you and I hope not our last. The walk was lovely, with ever changing scenery, and we were lucky with the weather this time. Showers on day 1 then sunshine thereafter, but a bit windy nearer the coast. The highlights were the high level days Jedburgh - Kirk Yethholm - Wooler. Waymarking was excellent. We were glad we split the final day, both for distance and tide timing reasons, as it also gave us more time to explore Holy Island on the last day.